I first heard about the author through wargaming circles. His absolutely immense compendium of 'Orders Of Battle' (OOBs) were always discussed in gaming forums etc. I am not sure exactly when, but he released his magisterial list free for all to use. This was and is an absolute godsend to wargamers. 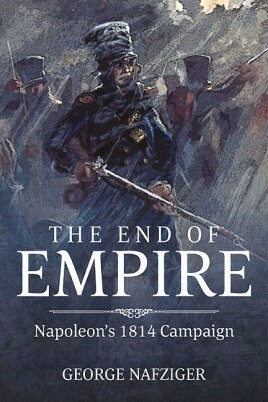 The book, End of Empire, is a tome on the subject. It is so well written that at times it is frustrating. Let me explain. Mr. Nafziger writes so clearly about the events that it is hard to remain calm and non-committal while reading the book. You can easily follow the campaign, so the frustration comes when Marmont, Macdonald, or some other marshal of France, do not do what obviously needs to be done. Time and again, Blucher is on the ropes with Napoleon ready to deliver the knockout blow, when one of his Marshals lets him off the hook. You find yourself, at least I do, imagining what Massena or Davout could have done in the other Marshals' shoes. Do not even get me started with the allies. Their attempts to get to Paris are as embarrassing as watching Bumble Bees in slow motion trying to get back into the hive. The book shows exactly what transpired during Marmont's treachery. Ragusa (Marmont was the Duke of Ragusa) became as widely used in the 19th century for traitor as Quisling was in the 20th. The book delves deeply into the different generals and their thinking and reasoning, or lack there of. To me, the writing transports the reader to 1814 and keeps the reader in the grip of the story as well as any non-fiction work can. The book is also liberally supplied with black and white images of the different generals and battles. It is also well supplied with maps so that the reader can follow along with the campaign easily. I am waiting, albeit impatiently I might add, for the rest of Mr. Nafziger's Napoleonic books to be released by Helion&Company.